1. Hide beer in the shower. 2. Buy them boy smellys for crimbo and birthdays. Ok, so I am being somewhat tongue in cheek here, but every Christmas or birthday I can be safe in the knowledge that I will be able to find some sort of smelly to buy if my imagination for presents otherwise fails me. For example, last year I purchased Paco Rabanne 1 Million for the boyfriend. Hunting high and low for the gold bar gift set (basically the same as the normal bottle, but in a giant gold bar with a shower gel for about the same price as the normal bottle). Went down a treat. This year the boyfriend has accumulated a few fragrances that he appears to be loving that I thought I would share with you in case you are looking for boy-present ideas. I’m not great at describing male fragrances so I am going to go all ‘nose’ on you and use the top/heart/base note descriptions to try give you an idea of what they smell like. Love the ad for this (a naked Marc Jacobs) and the bottle (a chrome coloured thing that looks like it’s been punched). The smell is a bit different than the usual male fragrance, with quite a peppery scent. Explained when I looked up the notes… top notes are pink pepper and pepper, heart notes are masculine woods, Elemi Resinoid (whatever the heck that is) and Benzoin (sounds like a type of medication) and base notes of vetyver, white moss and patchouli. Described as a ‘peppery, woody spicy’ fragrance, I’d certainly agree with the peppery. Saying that, this is the smell that makes me go ‘Mmm’ the most – so my personal favourite of this post selection. This one has that special something that would male me shamelessly stalk a man wearing it, just to sniff him. Which is why it’s a good job that man wearing it is my boyfriend. I was surprised, when given a selection of fragrances to play with this was the first one the boy went for. He’s not a big Beckham fan or remotely interested in any sort of ‘celeb’ endorsement – so I was a bit bemused. Must be the smell?! This one is described as a citrus scent, with top notes of blood mandarin, crushed leaves and frozen lemon, heart notes of lavender, absolute sage and frozen basil and base notes of tonka beans, sandalwood and vetiver. I have no idea what vetiver is but I take this as a generally citrus scent, but with a few manly bits (sandalwood) thrown in to ‘grrr’ it up a bit. The plus side of this one is that whilst I was reading up on the various notes, I spotted that there is a gift set available for under £20 from Boots. Bargain. A ‘woody’ scent, apparently – this one has top notes of bergamot, guaiac wood, heart notes of vetiver, cedarwood, sichuan pepper and base notes of cacao and amber. I have this on my wrist as I type can smell something a bit powdery fresh about this one, but in a manly way – not a flowery female way although having said that – I’m wearing it and quite like it…. maybe could be a joint present? So there we have a bit of a round up of male fragrances. Apologies if the ‘notes’ thing is all gibberish – I thought it was the best way to describe the fragrances as my descriptions tend to be a bit silly (I described shea butter as reminding me of bananas recently…). Also, and I hope the boyfriend doesn’t read my blog any time soon. But this is a rather fabulous gift if your not 100% sure which fragrance the smelly boy in your life might like? 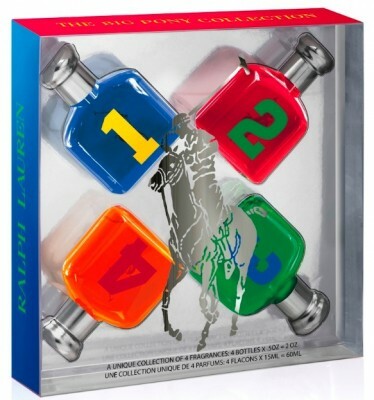 I picked this set of 4x 15ml fragrances from the Ralph Lauren Big Pony Collection up from Boots for £28. Bargain. Plus, being the girl I am – I like the cute mini-sized bottles. Paco Rabanne & Ralph Lauren Big Pony collection bought by me, other fragrances provided by PR. Marc Jacobs Bang – Thanks for the review – at least the fragrance sounds test worthy. I actually got an eyeball full of Mr. Jacob’s rear end at my parents house over the weekend which was a little weird. I’m glad he’s happy with his body image, but the whole thing is a little sad too. An oily man wearing a fragrance that smells like pepper – sounds like a roast to me.